London’s dry favourite is making a comeback. Drinking gin has never been so popular, so we’ve taken a look at how it is made, how to prepare it and how to pair it with food. If you want to know how to pair gin & tonic with any of our chef’s menus, don’t hesitate to ask them. Menus start from £39 per person and are available to view here. The key ingredient to any gin is juniper berries. In most cases, between six to twelve botanicals are blended to create a unique flavour, however some gins have as many as thirty. Typical botanicals include angelica, cardamom, cubeb, coriander and liquorice, but however many you choose, the predominant flavour is always the juniper berries. When your botanicals have been selected, they are processed through a copper still over a period of a day or two. Such a swift distillation process makes gin a popular interim spirit for whisky distillers. Most gin aficionados agree that the perfect gin tonic is one part gin to two parts tonic served over ice. The garnish, however, remains a much disputed topic. Lemon and lime take the top spots, but we recommend opting for a garnish that contrasts with the botanicals present in the gin. Why not try mango peel or pink grapefruit? 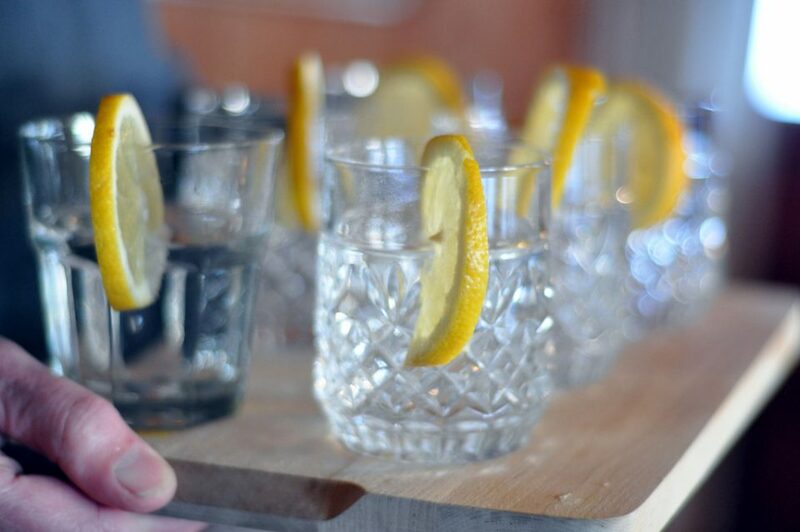 As your G&T is almost two thirds tonic, make sure you’re investing in a good tonic water. Most gin brands recommend the tonic waters that best complement their spirit. Just as every wine has a distinct bouquet and flavour that complements a particular ingredient or dish, gins too have their unique subtleties. Finding common ingredients or contrasting flavours in the gin and your dish is a good place to start when you pair gin with food. With so many botanicals, finding matching aromas shouldn’t prove too difficult a task. We’ve taken a look at one of our favourite gins, Isle of Harris Gin, and what dishes to pair it with. These unashamedly Scottish distillers are a tight-knit clan located on the Isle of Harris far off the coast of Scotland. First and foremost a whisky distillery, the Isle of Harris distillers have chosen to occupy themselves with making one of the finest gins on the market in the time it takes to distill “The Hearach” (their first whisky). Juniper, coriander, orris root and cassia bark are among the nine specially selected botanicals that go into making this gin, but it is the ninth ingredient that distinguishes it from the rest: freshly harvested sugar kelp from the deep underwater forests of the Outer Hebrides. The seaweed gives the gin a distinct salty-sweet subtlety that pairs well with both savoury dishes and desserts. We recommend pairing this gin with fish dishes or shellfish, particularly fresh Scottish prawns or langoustines. The Isle of Harris distillers have even created a sugar kelp aromatic water. Add a few drops of this maritime concentrate to your fish dishes while pan-frying or even to your gin and tonic to really bring out the algae’s flavour. If you’re interested in pairing other spirits with food, see our introduction to whisky and how to pair it with food.